With home prices nearly back to where they were when the housing crisis began, CoreLogic’s principal economist Molly Boesel compares the duration of the recent cycle to those of other downturns. While there hasn’t been a comparable period of performance nationwide, she looks at several regional ones. After hitting peak in 2006, the national price level fell for five years, finally reaching bottom in March 2011. Most other sources set the date for the bottom of the market to exactly a year later which may indicate they are using inflation adjusted numbers. From peak to trough, prices fell 33 percent nationally. As of July 2017, CoreLogic data shows prices were approximating the 2006 level. Boesel compares these numbers to those of the Texas oil bust in the mid-1980’s which resulted in a 16 percent decline over 3.5 years. The peak to recovery cycle in that downturn took nearly nine years. In the early 1990s in California, defense and manufacturing job losses led to home price declines in that state. After falling by 15 percent over five and a half years, home prices in California fully recovered after eight years. The U.S. home price decreases that started in 2006 were twice as severe as these two regional declines. While national home price numbers are nearly back to their peak, the recovery is far from even. Nevada, where prices dropped the farthest of any state, 60 percent, the 11-year period that has elapsed has left the state 27 percent short of its March 2006 peak. In Colorado, on the other hand, prices fell 14 percent from an August 2007 peak but have now surpassed that peak by 42 percent. Boesel calls Colorado “an extreme case” of rapidly rising prices, but says 34 states are now above their pre-crisis home price levels. Boesel says inflation should also be factored into the pace of recovery. From the peak in housing prices through this past July, the inflation has totaled just under 18 percent. When home prices are adjusted for that, the trough was deeper, down 40 percent from the beginning of the cycle, and the recovery shallower; prices remain 17 percent off the peak. 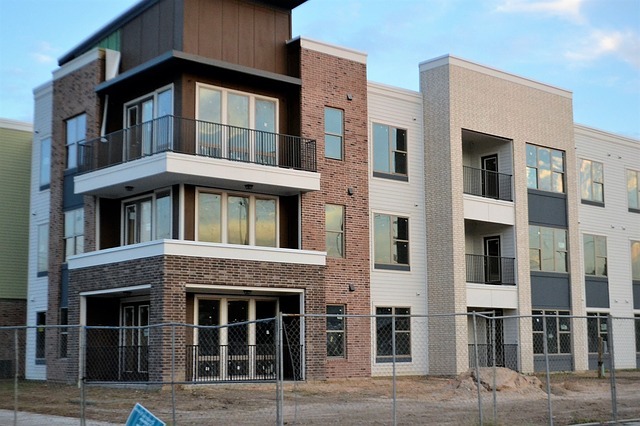 Source: With home prices nearly back to where they were when the housing crisis began, CoreLogic’s principal economist Molly Boesel compares the duration of the recent cycle to those of other downturns. While there hasn’t been a comparable period of performance nationwide, she looks at several regional ones.After hitting peak in 2006, the national price level fell for five years, finally reaching bottom in March 2011. Most other sources set the date for the bottom of the market to exactly a year later which may indicate they are using inflation adjusted numbers. From peak to trough, prices fell 33 percent nationally. As of July 2017, CoreLogic data shows prices were approximating the 2006 level. Boesel compares these numbers to those of the Texas oil bust in the mid-1980’s which resulted in a 16 percent decline over 3.5 years. 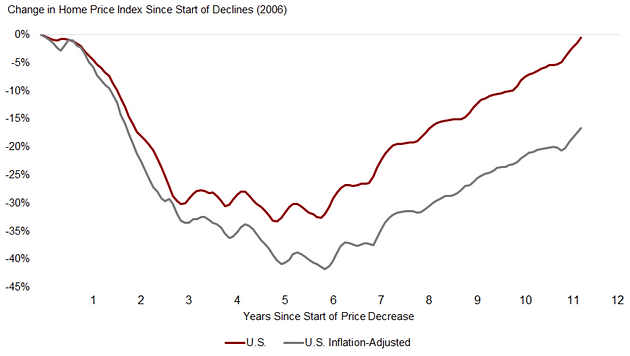 The peak to recovery cycle in that downturn took nearly nine years. 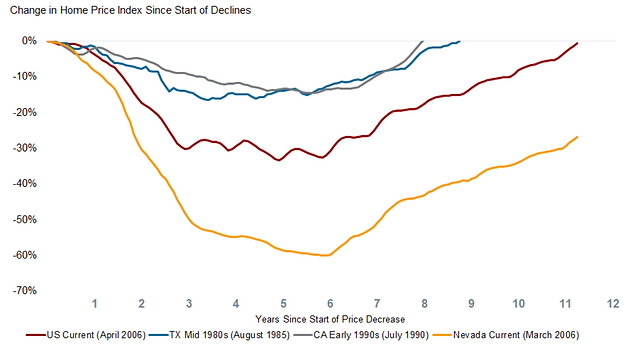 In the early 1990s in California, defense and manufacturing job losses led to home price declines in that state. After falling by 15 percent over five and a half years, home prices in California fully recovered after eight years. The U.S. home price decreases that started in 2006 were twice as severe as these two regional declines.While national home price numbers are nearly back to their peak, the recovery is far from even. Nevada, where prices dropped the farthest of any state, 60 percent, the 11-year period that has elapsed has left the state 27 percent short of its March 2006 peak. In Colorado, on the other hand, prices fell 14 percent from an August 2007 peak but have now surpassed that peak by 42 percent. Boesel calls Colorado “an extreme case” of rapidly rising prices, but says 34 states are now above their pre-crisis home price levels.Boesel says inflation should also be factored into the pace of recovery. From the peak in housing prices through this past July, the inflation has totaled just under 18 percent. When home prices are adjusted for that, the trough was deeper, down 40 percent from the beginning of the cycle, and the recovery shallower; prices remain 17 percent off the peak.